"The #1 Project Management Software for Ad Agencies and In-House Creative Teams." 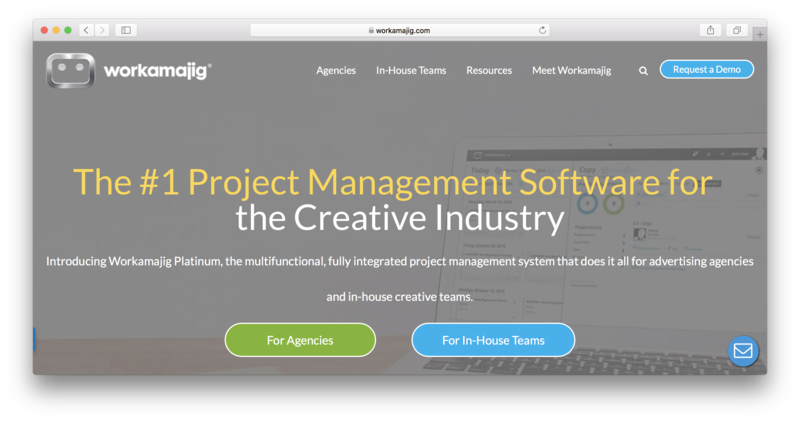 Workamajig Platinum is the most powerful, innovative, responsive, mobile-friendly and intuitive project management software for ad agencies, design firms, in-house creative departments and everyone else in the creative industry. Designed by agency professionals for use by agencies, Workamajig is designed specifically to meet all of the management needs of a creative firm, including accounting, collaboration, CRM, project management, digital proofing, and media management. More than 3,000 Marketing firms and Agencies - including 20 percent of Fortune 500 companies—rely on Workamajig to keep their projects organized and their employees and clients happy. Workamajig is the most selected creative management system on the market. And that’s because we know how agencies work. Workamajig Platinum scored 82/100 in the Project Management category. This is based on user satisfaction (71/100), press buzz (40/100), recent user trends (rising), and other relevant information on Workamajig Platinum gathered from around the web. The software allows creative agencies to easily and efficiently produce creative content. It also allows in-house teams within a production agency to collaborate in real time to save on time and costs. Built-in analytics provide users with additional supplemental quantitative information on the performance of the team and the agency in general. Workamajig helps users in the creative industry to perform their tasks in a time- and cost-efficient manner. The software gets into the process starting with the project proposal. Workamajig offers automated project cost estimation and scheduling for clients. Automated creative briefs are also provided for instant client presentations. Agreements and client conversations are also saved and stored within the platform to streamline the agreement processing. This makes conversations with the client easily searchable and easily integrated when creating projects. In the project launching phase, the Workamajig software also performs its functions of lessening user workload. Automated dashboard and charts allow users to allocate resources effectively for a certain project. Skill sets and capabilities are listed and organized for perusal of the project manager. Budget costs and items are also included and managed for interpretation. During the implementation stage, it is imperative that users keep track of every single detail concerning the project. This is where Workamajig enters the scene. The software allows managers to keep track of the revenue forecasts in certain projects for effective reallocation. It also gives users the ability to determine efficiency lines and possible bottlenecks ahead of time. On the post-implementation phase, it is also important to have an insight to the performance of a completed project. The software gives users convertible and usable insights on the revenues and expenses committed during the project. Invoices can also be done automatically, saving time on printing and manual data typing. Streamlined client approval and feedback maintains the original schedule of the project and to be able to do editing within considerable time. Insights on the timelapse per project allow project managers to make the necessary personnel/financial/resource adjustments to keep the project within the timespan allocated to it. Automated status reports give users, clients and managers additional insight on every possible corner of the project. The data and status are updated in real time, continually assuring clients. Real-time calendar allows users and collaborators to keep track of all the deliverables, deadlines, timelines and assignments within a single platform. Bottlenecks are also monitored by superimposing important project dates. Resource demand forecasting allows users to effectively manage resources ahead of time. Vendor search capabilities allow users to identify freelancers that may supply the shortage of skill within the human resource pool of the project and of the company in general. Projected cash flow from each project allows users to determine the viability and profitability of a project. It also determines the possible source of financial leak within the project before it gets too late. Comprehensive budget demonstration allows user to determine budget demand per project and per job responsibility. Digital file sharing allows users to keep track of all the content within the system. This ensures files will not have missing versions after processing. Outlook and Google integration allows current users to integrate their resources and schedules across platforms. This also ensures the project is shared in multiple avenues. Simplified accounting process allows users to have less time dealing with the financial balance of the projects and the system in general. This keeps track of all the orders and costs incurred within a specific project. Banking function integration lets users reach reconciliation with the data from the banks where project funds come and go. Excel and Google Docs integration ensures current users will have their data easily transferred to common software. Business trends data gives managers an insight on the characteristics and demands of the client. It also allows for the determination of pipelines in the sales performance of the firm. Communication tracker gives users the access to the demands of the clients in real time. Social media integration maximizes the sales reach of the projects as soon as they become completed. The software is integrated to the most common platforms and software in the market such as Google Docs, Excel and outlook. Integration to social media sites also increases the sales performance of each creative project. With a centralized calendar, centralized dashboard and progress tracker, everything can be seen with a bird’s-eye view. This allows even the smallest data to be recaptured into the analytics. By integrating the demands of the client within the software, workers and freelancers are given an idea of the needs and specifications of their output. This is also partnered with real-time feedback mechanisms given to clients allowing producers to modify their work accordingly. Profits and revenues are easily tracked with the software. Providing almost holistic monitoring on all aspects of each project, the software can provide excellent analytics as soon as the project is completed. Expenses and losses are also taken into account. This data is reflected on the balance sheet produced by the automated accounting system within the software. By keeping track of the time spent on a project, the software gives a managerinsight on the possible delays within the operations. Finances and instantaneous predictions are also given by the trackers within the system, allowing managers to determine the spread of the company’s resources. The software offers similar payment schemes for creative agencies and in-house creative teams. There are only slight differences on the services offered. For entry-level pricing plan, a $50 per user per month scheme provides access to up to five users. The rate goes down per individual as the users increase in number. Agencies with 100 or more users are charged with $32 per month per user. All pricing schemes include free training and consultation and vendor and client logins. The first month of the usage serves as the free trial period for the users. Traditional and Evolve programs for implementation are offered on the agency packages. Both packages, however, offer on-site consultants for the implementation of the program. Workamajig aids creative agencies and teams to come up with their creative outputs and projects in an easier and more comfortable way. With holistic assistance from the acceptance of a project and the proposal of a portfolio to the submission of the outputs to the analysis of the performance of an entire team, Workamajig works its magic by helping employees and managers streamline processes. An additional feature on budgeting analysis offers CEOs and CFOs to determine the viability of the work production within the team in a given year. This allows financial managers to adjust rates and costs for more efficient production in the future. The #1 Project Management software for the Creative Industry. Collaborate on one platform Reduce communication bottlenecks that may be slowing your team’s productivity. Streamline your collaboration instead. Get accurate data Generate reports with real numbers based on the latest estimates, time tracking information, project reconciliations, and more. Eliminate repetitive input Optimize your time management with automated processes that free you from manual tasks. Improve visibility for managers & staff Get every detail on every project, delivered to your dashboard with clarity and in real-time. Generate in-depth reports Make better decisions with an easy-to-use reporting tool that gives you powerful insights. Meet project goals and deadlines more effectively. See high return on investment Avoid hidden fees and unexpected consulting charges, with a transparent pricing model. All on-boarding, training, and ongoing support is included in the price. Does Workamajig Platinum integrate with any other apps? While we are fully equipped for the typical creative firm we do have a syncing to Strata for Media planning and Buying. We also have Calendar Syncing with Outlook, Google and iCal calendars to avoid multiple entry issues. Who are the main user groups of Workamajig Platinum? Our users are those who work in Advertising or other Creative firms as well as in-house marketing and communications departments. Does Workamajig Platinum offer multi-user capability (e.g. teams)? All users of Workamajig have a unique User ID and Password which will be associated with specific rights in the system. What are some applications Workamajig Platinum is commonly used in tandem with? What platforms does Workamajig Platinum support? Workamajig Platinum is build in HTML5's fully responsive design so that makes Workamajig available on multiple platforms. Does Workamajig Platinum offer an API? What is Workamajig Platinum generally used for? Workamajig is an All Inclusive system to manage the entire Agency. This includes features in CRM, Project Management, Resource Management, Communication and Collaboration, Time tracking, Billing, Purchasing, Full Financial Reporting and Business Intelligence. Does Workamajig Platinum offer guides, tutorials and or customer support? Workamajig has multiple resources for it's users included as part your service including Training, Support (phone, email and chat), on-line help guide, user forums, user conferences, 'show me' guided instruction and more. 3.55/5 based on 167 user ratings. Fabulous Software for the Agency Way! Oct 25, 2018 Lyn Porter // Traffic Manager at MarketReach, Inc.
What do you like about Workamajig Platinum? Everything you need to run your creative agency is in ONE software w/ fantastic reporting. What do you dislike about Workamajig Platinum? Still a few (minor) bugs here and there as "Platinum" is a new version that does not need flash to work. Having said that, any bug that has been reported has been fixed by the amazing team @ Workamajig! What have you been using it for and what problems did Workamajig Platinum solve? We use Workamajig for everything in the agency from the beginning of a creative project all the way to invoicing at the end of a project. Creating new opportunities/contacts/companies is faster in platinum than in classic. There are feature/aspects I prefer to use Platinum and some in classic. Especially items that in order to fit within the design/responsiveness you have to click to many times or use the dreaded more button.